This section of age-well.org is being developed by one of our writers, journalist Michele Botes who has been suffering from lower back pain since she had an accident and damaged her coccyx and the discs in her lower spine when she was sixteen. Michel admits she is not a back specialist, but she has had a lot of experience visiting and discussing her problems with physiotherapists, chiropractors, osteopaths, acupuncturists and massage therapists and has tried many different treatments, each with their own level of discomfort and effectiveness. She is therefore well placed to develop this section and knows where to get the information she needs to make this series of articles informative and helpful for our readers. Remember, of course that the articles in age-well.org are designed to help you make the right choices about taking responsibility for your health and not to replace the advice of a doctor or medical professional if something is seriously wrong. 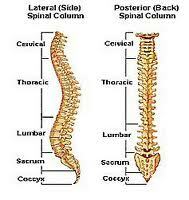 What is the Spinal Column? The spine is an intricate structure of bones, ligaments, muscles and nerves. Also called the spinal column or the vertebral column, it comprises a series of bones called vertebrae stacked one upon another, the whole structure is designed to be strong enough to hold the body upright and flexible enough to give the human body the movement it needs. When something goes wrong with the back, we experience a high degree of pain because the nerves in the back are highly sensitive. Many different structures in the spine can cause back pain. The large nerve roots that go to the legs and arms or the smaller nerves that innervate the spine can become irritated; the bones, ligaments or joints can be injured or the discs may herniate. There are four major regions of the spine Cervical, Thoracic, Lumbar and Sacral Spinal & Coccyx. The cervical spine or neck supports the weight of the head and protects the nerves that go from the brain to the rest of the body. 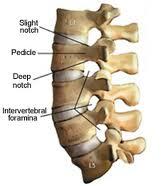 This section of the spine has seven vertebral bones that become increasingly smaller at the top. The top two discs are used for rotation and the discs known as C5-C6 and C6-C7 give the extension and flexion movements. When a muscle, ligament or tendon become injured or strained from a sudden wrong movement, accident or overuse the result is often acute pain. This will often heal over time without the need for surgery, but non surgical treatment such as massage the use of ice or heat, medication or manipulation might be necessary. If pain lasts longer than a few weeks and is accompanied by arm pain, tingling or numbness this often means that there is a problem with the anatomy of the cervical spine. Pain that radiates down the arm and into the hands and fingers, is often caused by a herniated disc in the cervical spine or by spinal stenosis in the cervical area, which results in a pinched nerve in the neck. The treatment required will depend on the diagnosis. 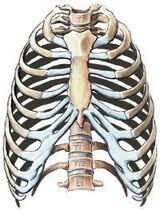 The thoracic spine comprises 12 vertebrae and provides stability and structural support to the upper back. 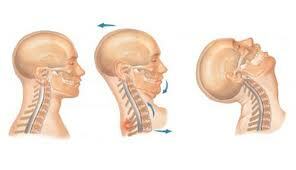 It is the most static part of the spine and is strong enough to protect the vital organs of the heart and lungs. Upper back pain is not as common as lower back pain. Injuries to the thoracic spine are rare as this part of the spinal column is not designed for motion, but irritation of the shoulder muscles or dysfunction of the joints in the the upper back can cause back pain, and strain or injury to the intercostal muscles between the ribs can be both painful and debilitating. The lower back is flexible and designed for a lot more movement. It also has to carry the full weight of the torso. These two facts mean that it is the most frequently injured area of the spinal column and lower back pain is, therefore, the most common back complaint and far more usual than upper back pain. Most of the movement comes from the vertebrae L3-L4 and L4-L5, the ones most likely to suffer from osteoarthritis or wear and tear. The two lowest discs L4-L5 and L5-S1 are the most likely to herniate, causing lower back pain and sciatica. Most episodes of lower back pain are caused by muscle strain. Many people do not realize how bad such pain can be. A strain does not sound very serious. However, trauma to the lower back muscles, ligaments and tendons can be very debilitating and cause severe back pain. Please read our article on lower back pain for further information. The sacrum is situated at the base of the spine below the lumbar region. It is shaped like a triangle and is situation between the two halves of the pelvis and connects the spine to the lower part of the body. The sacrum is connected to the iliac bones of the pelvis by the sacroiliac joints. Pain in this area is known as sacroiliac joint dysfunction. 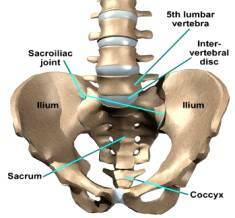 The coccyx or the tailbone is situated in the sacral region at the very base of the spine. Tailbone pain is called coccydynia. Pain in both the sacrum and the tailbone is more common in women, than in men. This might be because the pain can often be caused by childbirth. Another cause can be falling backwards and landing on the base of the spine, often bruising or fracturing the coccyx in the process. Another cause is dislocation of the coccyx or pain can be brought on by sitting awkwardly or too much. In roughly a third of cases there is no known cause. Treatment can include massage, exercise or manipulation. Cortisone injections can help with stubborn cases and in extreme cases removal of the coccyx may be the only solution.